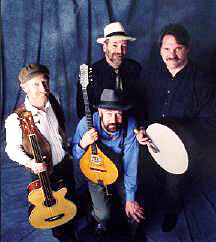 Folk music, dry comedy, and fiery Celtic instrumentals are the trademarks of The Wood's Tea Company. In concert, the Vermont-based group pulls from a cache of over a dozen instruments and weaves in and out of various styles. Look for several banjos, guitars, bodhran, hammered dulcimer, and tin whistles. "There is a coherence in our style," says band member Rusty Jacobs. "We choose music that fits our sound. To define us you have to find the common thread between sea shanties, bluegrass, Celtic music and Woody Guthrie tunes. We also do some comedy. That helps smooth some transitions and paradoxically gives us room to do some very serious material." The group has recently released their fifth album, Side by Each, on Wizmak Records. It is their first on the Wizmak label, and also their first recording with band member Tom MacKenzie. Mike Lussen rounds out the group. The band's schedule keeps them on the road much of the time. The Wood's Tea Co. boasts a long and impressive list of past performances including New York's Lincoln Center, the Mayflower II in Plymouth Harbor, the Hatch Shell Concert Series (home of the Boston Pops), the Tall Ship Extravaganza in Boston, Silver Dollar City (Branson, Missouri), the International Celtic Festival (Hunter, NY), and First Night Celebrations in the northeast. 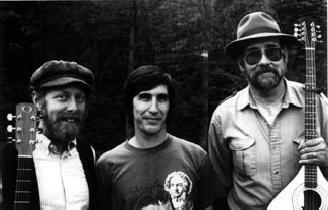 They've shared concert bills with Taj Mahal, Livingston Taylor, The Battlefield Band, Vassar Clements, John Hartford, Aztec Two-Step, and Rare Air. With more than 5,000 people on their mailing list, whatever they're doing is working!